Shown here is an additional close up view in which the name of the view Villa D'Este can be seen (lower left) in the pattern. Shown here is an image of the exterior of the washbowl providing a better view of the border pattern. 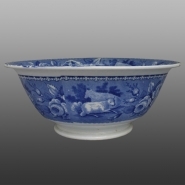 Maker: Samuel Moore & Co.
A washbowl printed with a titled view of Villa D'Este. After leaving England, Caroline, the estranged wife of the future George IV bought this villa on Lake Como in 1815. This view shows her on the lake with her lady in waiting and her supposed lover, Bartolomeo Pergami. This pattern probably dates to the early 1820s when the failed divorce suit brought by her husband first made Caroline's alleged indiscretions with Pergami public. Samuel Moore & Co. is believed to be the only factory that produced this pattern.